Research has shown patients do better when cared for by RNs who have earned a Bachelor of Science. 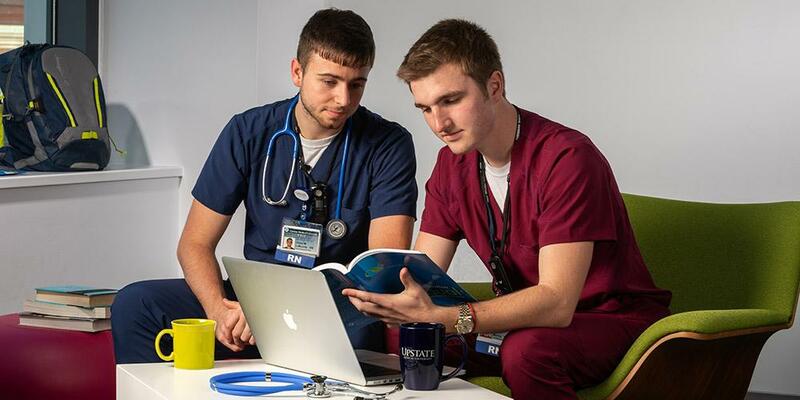 Upstate Medical University’s Online Bachelor of Science in Nursing program is an opportunity for Registered Nurses to improve their skills and expand their horizons in health care. The Online RN-to-BS in Nursing offers unprecedented flexibility for full-time and part-time students, including working nurses. Our program focuses on theory and application, provides exposure to many areas of nursing, and serves as a foundation for graduate study. It prepares you to deliver comprehensive care to patients of all ages in a variety of settings as a direct care provider and as a nursing leader. Most full-time students complete degree requirements in two years. Part-time students taking two or three courses per semester will complete the degree in four or five years. Degree requirements must be completed within 5 years of matriculation. Our curriculum will prepare you to be a leader in a technological, information driven, complex healthcare system. Take your courses conveniently. Courses are offered online so you can create a schedule that meets your life and lifestyle. Your faculty advisor will work with you to determine the best program for you. A minimum of 30 credit hours earned through Upstate Medical University, online or in person, are required to be awarded the Bachelor of Science in Nursing degree from the College of Nursing. Last Modified: March 26, 2019. Contact Alice Boyce with questions about the content of this page.